I have used all kinds of interfacing, branded ones, generic ones. You might be surprised to hear this. Generic ones are just as good! People often ask me what to do when their interfacing doesn't seem to fuse well to the fabric despite their doing everything right. My answer: throw the interfacing away and get a new batch/brand. Why ruin more fabric? Here is how I fuse interfacing to my fabric. It works for me. 1. 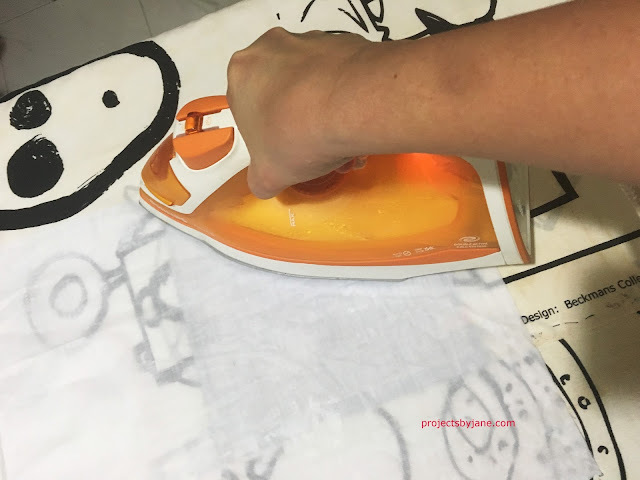 Iron your fabric until there are no wrinkles. Remove any dirt or lint or worse, thread(!) from fabric and interfacing. Place interfacing grainy side down on wrong side of fabric. 2. 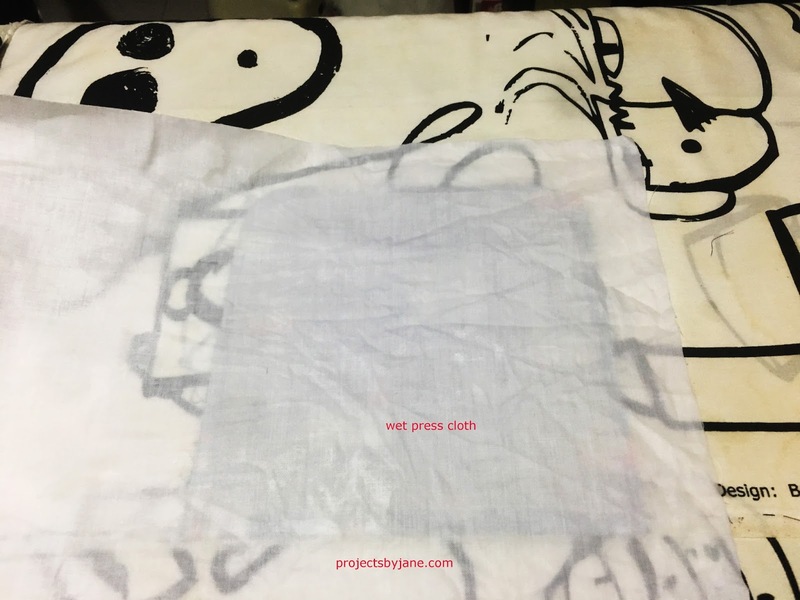 I use a dry iron and create my own "steam" by placing a wet press cloth over the interfacing+fabric. The wet press cloth shouldn't be dripping wet! 3. I press the hot iron over the press cloth where the interfacing is. I do it systematically one area at a time, overlapping the areas to ensure every spot is covered. The idea is to press and lift the iron and not glide the iron around. I find it useful to press my body weight on the iron. (I have weak arms) I cover the whole area twice. 4. Lastly I flip over to the right side and iron very quickly to get rid of any wrinkles. (make sure your iron is clean) Don't hover your iron over the fabric or you may get some bubbles. Put your interfaced fabric away on a flat surface and don't handle it until it cools down. Note: Most of the fusible interfacing I use has grainy texture on the glue side. 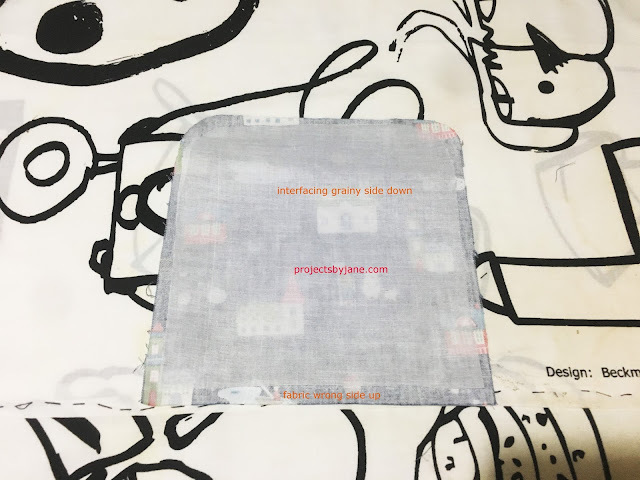 When I explored using the fusible interfacing which has shiny sleek surface on the glue side, I noticed that using a pressing cloth doesn't work well. 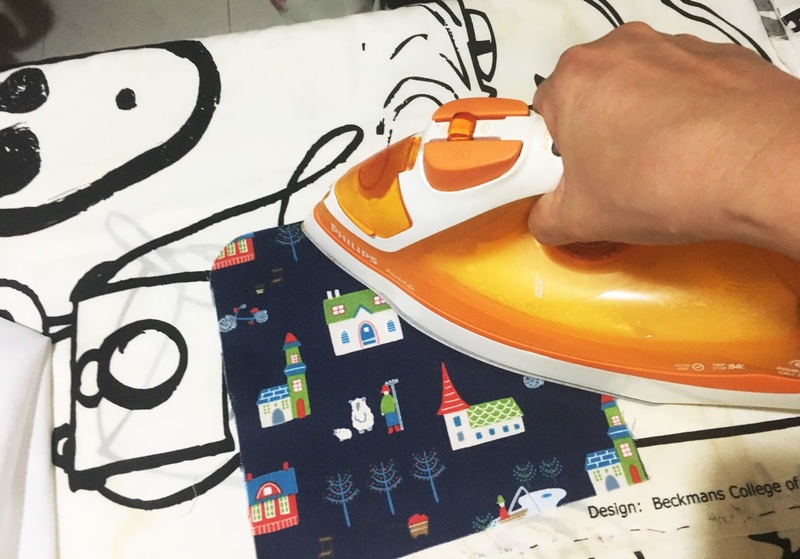 This kind of interfacing requires direct contact with the hot iron and I even use a steam iron to make it stick. What about fleece? Some fleece, you can interface the same way as above. But there's also some fleece which after interfacing makes the fabric look horribly wrinkled. For such fleece, I find it necessary to first interface the fabric with perhaps a light weight interfacing. I have also come across some fleece which would not adhere well with a press cloth. There's one thing I've done which I find really useful for large pieces of fabric. As you know, the width of your ironing board isn't that wide. I don't really like to move my fabric+interfacing in the middle of fusing. So what I did was to make my own ironing "board". I take a fairly large piece of batting big enough for the largest bag I'll ever make, cover with fabric and place it over a small cheap table. And that's my ironing board. Chances are you may ruin that table so don't use an antique table please!